We are offering an Extended Fall CSA Share for $140 for 4 weeks after the Summer Share is over (1 extra week added from past years) . This will begin the week of Sept. 29-Oct. 5 and the last distribution will be the week of Oct. 20-Oct. 26. Our Fall Share will give you an opportunity to receive many varieties of fall produce from Tantre Farm. In order to receive all 4 shares, please register online anytime before Sept. 28. We also offer PRORATED SHARES if you decide to sign up after the Fall CSA has already started or if you need to miss some of the beginning weeks. You should plan on picking up your first, prorated box the week AFTER you sign up along with full payment for your share. Non-members and returning members are welcome! Please let us know if there are any questions. “EXTENDED FALL CSA SHARE” registration is now OPEN for 2019. EXTENDED FALL CSA SHARE: Each week we will try to have 8-12 items, which may include a variety of Cooking Greens (kale, collards, spinach), Salad Greens (lettuce, spicy greens mix, arugula), Brassicas (cauliflower, broccoli, cabbage, Brussels sprouts), Roots (potatoes, turnips, carrots, radishes, beets), Fruiting Veggies (tomatoes, peppers, winter squash, pie pumpkins, mushrooms), Alliums (garlic, onions) and celery. You will receive a weekly newsletter by email at the beginning of each week describing your share items, cooking and storage tips, important dates, helpful hints, recipes, and feature articles from the farmers. Sometimes we also are able to offer a Fall cooking or preserving class for our Fall members. Once again we are offering online registrations, so please refer to the following payment options. 1. Credit card payments (online transaction, so you pay a small 3% fee)–If you are splitting a share, please make only one credit card payment. 2. Check payments (no online fee)– If you would like to use a check, you will receive a Confirmation/Invoice email after registering. Then you can send a check (or checks, if you are splitting a share) written out to “Tantre Farm” to our mailing address for the balance due listed on the invoice. IF YOU ARE SPLITTING A SHARE, PLEASE INCLUDE BOTH CHECKS IN THE SAME ENVELOPE. We will try to be in the same location every week at the Ann Arbor Farmers Market (www.a2farmersmarket.org), but are not always able. There is a map on the outside wall of the market office, where our stall is listed. 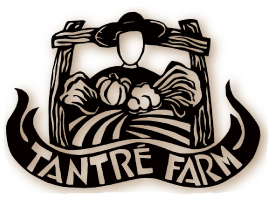 Please always look for the large, canvas Tantré Farm sign as you walk around the market. Then follow instructions on the white board, and especially remember to check off contact person’s name and take a newsletter, if you need it. It can get very crowded at the market, so for those of you who split shares, it might work better if you split your share at one of your houses, instead of at the stall where a lot of people are coming and going. Advantages for pick up at Ann Arbor Farmers Market: You can buy extra items from our stall and other vendors’ stalls and enjoy exploring the variety of Kerrytown stores and restaurants in downtown Ann Arbor. Some Saturday CSA members will be picking up their shares across the street from the Ann Arbor Farmers’ Market on the east side of 5th Ave. on the back side of the High School building. You can look for a sign that reads “Tantre Farm” and follow instructions on the white board. Please check off the contact person’s name and take a newsletter if you need it. There also will usually be someone available at the distribution site to help you. You can still find our Tantre Farm market stall somewhere at the Ann Arbor Farmers’ Market, especially if you need to purchase extra produce or have specific questions. Advantages for pick up at Community High: You are right across the street from the farmers market and can buy extra items from our stall and other vendor’s stalls and enjoy exploring the variety of Kerrytown stores and restaurants in downtown Ann Arbor. Please park on the North side of Hayes Road or in the driveway for those who are physically challenged. Go behind Main House to the “Distribution Shed” in the backyard. Please remember to check off contact person´s name and take a newsletter from the check-in table. Follow the instructions on the white boards inside. Get share box from walk-in cooler and choose the rest of the listed “share add-ons” that are bulk items inside and outside of Distribution Shed. Also, please feel free to ask a farm worker (in the herb garden or U-pick Flower Garden) or knock on house door, if you have any questions. Advantages for pick up at the farm: Walking paths around the fields, visiting the animals, playing, exploring, and picnicking, free u-pick flower bouquets, u-pick opportunities for other produce, extra produce in Grab Box, free-range eggs, and sometimes honey or other extra items for sale. This location is about 8 minutes directly north of downtown Ann Arbor. There are many buildings at this site, so look for the one that has the “sun window” on the building. Distribution is right on the front porch with shares in a reach-in cooler. Please check off your name on the clipboard, follow the instructions on the white board, and take a newsletter, if needed. There will usually be someone there to help you, if you have any questions. Advantages for pick up at the Hub: plenty of free parking, picnicking areas, and food artisan/farm market items for sale in the near future. DISTRIBUTION for Hub: Wed. 6 -8 PM and Sat. 9 AM – Noon. Pure Pastures (www.purepasturesmi.com) is a specialty grocery store offering grass-fed meat, eggs, dairy products, and organic, gluten-free, nonGMO products. Shares may be outside on the north side of the building, unless it gets too cold, and then they will be brought inside to the cooler. This will be a “self-serve” pickup spot, so please check off your name on the clipboard, follow the instructions on the white board, and take a paper newsletter if needed. Pure Pastures staff can answer limited questions. They are not responsible for shares left unclaimed, unless prior arrangements have been made. Advantages for pick up at Pure Pastures: There are opportunities for extra purchases from “a healthy alternative to the big chain supermarkets”. Argus (www.argusfarmstop.com) is a year-round, every day farmers market featuring over 100 local producers in all categories including produce, meat, eggs, dairy. Every purchase you make supports local farms and producers! They also have a cafe for delicious coffee and baked goods. Shares will be inside building in the back room. Simply ask a friendly Argus staff member and they will show you where your box is. Then you can check your name on the clipboard, and take a newsletter if needed. Argus staff can answer limited questions. There is no refrigeration, so please pick shares up promptly to enjoy your produce at its freshest! Argus is not responsible for shares left unclaimed, so shares left there after noon will be donated or brought back to the farm, unless prior arrangements have been made. Advantages for pick up at ARGUS: You have opportunities to additionally purchase a wide array local products to complete your local shopping experience. As well, there’s a great cafe and seasonal pop-up brunches are offered sometimes during drop off times. DISTRIBUTION at Argus-Packard: Sat. 10 AM until Noon.